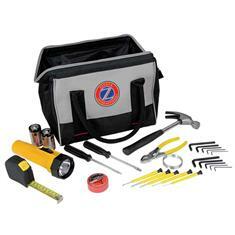 Realtors, Home Improvement and Apartment Communities know tools kits make great promotions. Our deluxe 23 piece set is packed in a tool bag with a reinforced wide opening that has room for additional components. It comes with the following tools; 10 piece Allen wrench set, flashlight with 2 D cell batteries (not inserted), hammer, pliers, precision 5 piece plier set, repair tape, Phillips screwdriver, Slotted screwdriver and a 16' tape measure. A great incentive when signing up new customers or rewarding existing ones!